If you are a pathology specialty registrar and a UK tax payer both your trainee registration fees and examination fees are a tax deductible expense and you are eligible for full tax relief. This could save you between 20% and 40% of your fees and you can make a retrospective claim within 4 years of the end of the tax year that you spent the money. 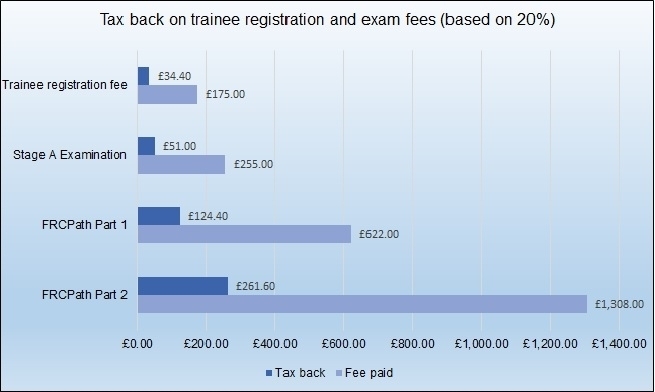 Clinical Scientists in a HSST programme can also claim tax relief on examination fees. There are a number of ways that you can make a claim to HMRC. If your claim is for less than £2,500, you can apply online, by completing a self assessment tax form, by printing and posting form P87 or by telephone. Claims over £2,500 must be made using a self-assessment tax return. Further information about how to claim tax relief is available on the gov.uk website. To contact the College about these issues, please e-mail us. Not all RCPath examinations are eligible for tax relief and some examination candidates have asked why. 4. Failure to complete the training and obtain the qualification will mean that the employee will not be able to continue in employment with the employer in the role that would otherwise have been available to them after qualification. HMRC will consider applications for specific examinations taken by doctors and scientists in training to be allowable for tax relief. Other medical royal colleges have applied for tax relief on their examinations but not all have been successful. Because of this mixed picture, the College decided to adopt a gradual approach, focussing first on those examinations that most closely meet HMRC’s criteria. In August 2016, the College applied for relief for examination candidates in a UK medical training programme, which was approved in May 2017. A further application for candidates in higher specialist scientist training (HSST) was made in February 2018 with approval in August 2018. The College is keen to see as many candidates as possible enjoy tax relief on their exam fees and is looking to see which other examinations, if any, might fall within the above criteria.